Rival fighters are terrorizing the Central African Republic, the government has lost control and the international community isn’t doing enough. 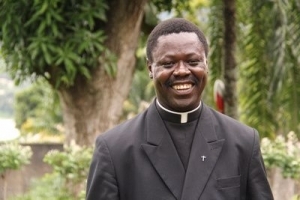 This is the message of Bishop Nestor-Désiré Nongo-Aziagbia of Bossangoa to a side-event at the 26th session of the Human Rights Council in Geneva on 20 June. “The chaos has reached an unprecedented level of barbarism,” says the bishop. “We face two rival armed groups that use violence, retaliation and reprisals. Killings are common place and carried out with impunity. The bishops’s diocese of Bossangoa has been at the centre of the crisis that began in late 2012. For many months, his church compound housed 30,000 people fleeing the fighting. Many of those have now returned home. Since December, the Muslim population has fled to the north of the country or to neighbouring Chad. Humanitarian agencies are unable to reach many because of the violence. “People are living in deplorable conditions inside the country and in Chad. They have lost their sense of human dignity,” says the bishop. The bishop says that the international media labels the crisis as a religious conflict between Christians and Muslims. But he says divisions between Christian and Muslim communities have been enflamed by political, economical and social instability. He says the conflict is being used to exploit natural resources by the different factions and their external allies. “The humanitarian crisis is in addition to an institutional crisis,” says Bishop Nestor-Désiré Nongo-Aziagbia. “The silence and lethargy of the government and the failure by international peacekeepers to enforce UN resolutions benefit allows armed groups to sow terror. Caritas supports an interfaith peace platform in the Central African Republic that works on the local level to bring about reconciliation between communities. Mgrs. Nestor-Désiré Nongo-Aziagbia, Bishop of Bossangoa will be speaking at a side-event titled, ‘The contribution of the interfaith platform to the reconciliation process in the Central African Republic’ on Friday, 20 June 2014 Palais des Nations, Geneva 14h30 – 16h30 Room XXI.